A companion website offers case studies, crossword puzzles, figures from the book in PowerPoint, and additional figures not found in the printed book at www.wiley.com/go/bellwoodhandbook. 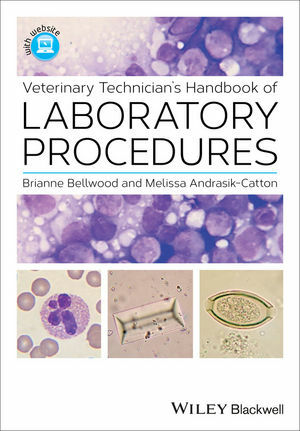 Veterinary Technician's Handbook of Laboratory Procedures is an invaluable tool for finding essential information on performing a wide range of laboratory tests. Brianne Bellwood, RAHT, is a full time instructor and the Program Coordinator for the Animal Health Technology program at Lakeland College in Vermilion, Alberta, Canada. She covers both the practical and theoretical components of several laboratory subjects for Animal Health Technology students. She is also the Program Coordinator for the Animal Health Technology program at Lakeland College. Melissa Andrasik-Catton, RVT, BS, was a full time instructor for 10 years and is now an adjunct instructor for Maple Woods Community College Veterinary Technology Program. She is also a Clinical Trials Manager for Product Development and Regulatory Affairs at Dechra, Development, LLC. She frequently lectures on the subject of Clinical Pathology at local, state and regional veterinary conferences.